Scott Kelly is a former NASA astronaut. He has become one of the greatest pioneers in history after spending 340 consecutive days in space. He is a former military pilot, engineer and retired U.S. Navy Captain. He served as a Flight Engineer on ISS Expedition 25. He was born on February 21, 1964 in West Orange, New Jersey, United States. 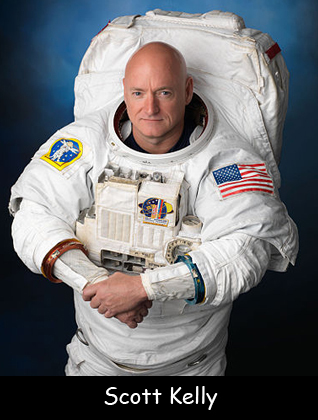 Scott has an identical twin brother Mark Kelly who is a former astronaut. This is why Scott and Mark were the first siblings to travel into the space. Scott received a Bachelor of Science degree in electrical engineering from the State University of New York Maritime College in 1987. In 1989, he became a Naval Aviator and completed his training at the Naval Air Station Oceana, Virginia. He earned his master’s degree in aviation systems in 1996 from the University of Tennessee, Knoxville. His first ever spaceflight was as a pilot of the Space Shuttle Discovery during the STS-103 in 1999. Till now, Scott Kelly has spent a total of 520 days in the space during 2 long-duration space station missions and 2 shorter-duration space shuttle missions. He commanded the International Space Station on Expeditions 26, 45 and 46. He did a twin study with his brother to figure out if spending longer times in space causes any genetic changes. Scott had a seven percent change in gene expression from Mark and those changes remained for 6 months after the expedition. He got his memoir published under the name ‘Endurance: My Year in Space and Our Journey to Mars’ in 2017.